We are offering Aluminum Industrial Name Plate. We put forth personal name plates which are also popular for personal reasons. These name plates are conventionally crafted out of wood, not plastic or metal. Because the name plates are meant for children, these personal name plates tend to come in fun shapes. 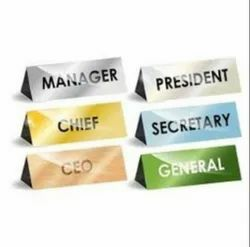 Our clients can avail from us high quality Door Name Plates, which are available with us in premium grade aluminium, stainless steel and brass that further ensure their sturdiness and durable finish. These are highly appreciated by our clients due to its visual clarity, excellent printing and longer service life.